The lych gate at the entrance to the churchyard was erected in 1920 in memory of the men of Allendale who fell in the Great War. The Viscountess Allendale performed the ceremony to commemorate the twenty-two menthe names of a further two were added after the Second World War. Septimus Fairlamb died after the Battle of the Somme in November 1916. This page contains information on him and some of the other men listed on the oak panels of the lych gate. Allendale sent many men to war between 1914 and 1918. Twenty-two of those who did not return are listed on the lych gate. They range in age from nineteen to thirty-seven; most were in their early twenties. The majority were ordinary men who enlisted as soldiers of the new armies. They had no concept of the horrors of trench warfare they would face on the Western Front. Some died early in the war; others experienced infamous encounters on the Somme, Ypres, Passchendaele and Arras. A lucky few have marked graves but several of the others were never found and lie where they fell. Allendonians also fought and died at sea, at Gallipoli and in Egypt and Mesopotamia. Over 80 years before the Iraq War of 2003, a soldier from Allendale was killed at Basra. Many of these men have memorials on the battlefields that are maintained by the Commonwealth War Graves Commission, but at least one lies in a wrecked and vandalised cemetery. That is why the people of Allendale saw fit to commemorate them in their own village in 1920 and why it is important the lych gatetheir memorialis properly maintained today. In November 1916 Septimus Fairlamb died near the Western Front. He had served in the Northumberland Fusiliers and is buried near Rouen. Septimus (who lived on Arnison Terrace) was 36 and left a widow, Emma, and two children. Septimus was the seventh and youngest son born to William and Eleanor Fairlamb. William was postmaster in Allendale, firstly at Victoria House and subsequently at the Old Post Office (now the Tea Rooms). The family had been living in Allendale since at least 1550. At the time of the 1901 census, Septimus (aged 21) was still living with his parents at the post office and working as a post office assistant. His future wife, Emma Charlton, was employed in the village as a maidservant to Dr. George Arnison. By the outbreak of the Great War, Septimus and Emma had married and had two children, Muriel and Percy. Septimus' parents had died in 1901 and 1904 (their headstone can be seen in Allendale churchyard) and his eldest brother, Llewellyn, was running the Post Office. Septimus volunteered for the 9th Northumberland Fusiliers, which was formed in Newcastle in September 1914. After training as a signaller, he arrived in France with his unit in July 1915. The battalion was to spend the entire war fighting in France and Flanders. Septimus would have been involved in the Actions of the Bluff (February 1916) and the Battle of Albert (JulyNovember 1916). The actions at Albert were part of the main Allied attack during 1916the Battle of the Somme. The Somme Offensive began on 1 July 1916 along a 30 km front (north of the River Somme between Arras and Albert) and ran until 18 November. It is chiefly infamous for the loss of 58 000 British troops on the first day of battle. The British advance was slow, and poor weather and snow finally brought an end to the offensive on 18 November. During the attack the British and French had gained only 12 kilometres of ground; resulting in 420,000 British; 200,000 French; and 500,000 German casualties. A number of British camps and hospitals were placed on the southern outskirts of the Norman city of Rouen and remained there for practically the whole of the War. Rouen was set slightly back from the frontline which made it a natural administrative base. A base supply depot and the 3rd echelon of General Headquarters were also established alongside the 15 hospitals and a convalescent depot. It is likely Septimus was among the wounded brought in from the front. The patients who died in the Rouen hospitals soon filled the St Sever cemetery and by September 1916 it was found necessary to begin using an extension. Private Fairlamb died aged 36 on Friday 17 November 1916 and is buried among 8,500 other casualties of the Great War. I visited the cemetery in July 2003, walking through an old flint gatehouse and into a beautifully maintained lawned area bordered by clipped hedges and cypress trees. War dead from Britain, Canada, Australia and South Africa lie under row upon row of simple white headstones. Some of the men who died were as young as 18; a great number are Septimus' fellow volunteers from the Northumberland Fusiliers. The widowed mother of Sergeant Allison was living at West View when she received news of his death at the Battle of the Somme in September 1916. James had grown up in Allendale where his father, John, was manager of the Co-op Store for many years and also a local councillor. He was the youngest of six children; his eldest brother, Alfred, was schoolmaster at Allendale at the time of the 1901 census. Like so many soldiers who died in the mangled trenches of the Somme, Allison has no marked grave and is remembered among the 72,000 names on the Thiepval Memorial. This remains the largest British war memorial in the world. Lance Corporal Parker had joined the same battalion as James Allison. The 1st/6th Northumberland Fusiliers formed at St George's Drill Hall, Newcastle, in August 1914. In 1915 the brigade joined the 50th Division and saw action at the Battle of the Somme. Like James Allison, Norman died there (on 5 November 1916) and is commemorated on the Thiepval Memorial. Robert grew up at Haggburn Gate, where his father Michael handled working horses on a neighbouring farm. He seems to have been a career soldier when war broke out because he belonged to a regular (rather than a territorial) battalion. Robert's brother, John, continued to live at Low Woolley in Allendale. The 1st Battalion King's Own Scottish Borderers was recalled from its base in Lucknow in India by the end of 1914. In March 1915 Robert's division sailed from Avonmouth bound for Egypt, where they landed two weeks later. British, Australian and New Zealand troops landed on the Gallipoli Peninsula in the Dardenelles on 25 April 1915. There were no proven tactics or even suitable equipment for a large-scale beach landing; it had not been attempted before and had been hurriedly devised. The 29th Division landed on five small beaches at Cape Helles, codenamed S,V,W,X and Y, from east to west. After early advances the Allied soldiers were pinned along a narrow coastal strip. Over 6,000 men died for an advance of 600 yards in a single May day. The Gallipoli campaign was a failure and Robert Elliott was killed there on 19 December 1915. Three weeks later his division was withdrawn and sailed for Marseilles. There was to be no respite however; upon arrival they proceeded to the Western Front. Robert was buried at Lancashire Landing Cemetery, on a small ridge named Karaja Oghul Tepe, 110 metres above the sea. It overlooks one of the five beaches where the division landed eight months earlier. That winked on the ledge. Frederick was the eldest son of Alfred and Jane Glendinning of Bridge End. At the time of the 1901 census his father was a cartman at the flour mill. He joined the 22nd (Tyneside Scottish) Battalion of the Northumberland Fusiliers, which was attached to the 34th Division in mid-1915. His battalion fought throughout the Battle of the Somme from April to November 1916, and then was among those who launched the Arras Offensive on 9 April 1915. On that day, British troops advanced from their positions at the village of St Laurent-Blangy (north east of Arras). By day's end the whole village was in British hands, though many soldiers were killed. Private Glendinning was among them and he is buried at the cemetery in the village. Also buried in the cemetery is one of the war poets, Isaac Rosenberg. He wrote the poem In The Trenches (right). The division of the Lancashire Fusiliers to which William was attached was formed in early 1915. Early clothing and equipment for these units was haphazard (many had to train in civilian clothes) and training was slowed by the continual drain of men for drafts to replace casulties at Gallipoli. The weather was damp with thick fog in the early morning. This, combined with smoke from the bombardments of both sets of artillery, made visibility poor throughout the day although the fog itself cleared by late morning. The news was conveyed to his parents William and Violet, of Low Mill. The couple had previously lived on Leadgate, where William senior was a cartman for the Co-op, and moved to Bridge End between 1901 and 1914. William Glenwright is remembered among the 14,690 names etched on the Posieres Memorial; men who fell at the Somme and have no known grave. Robert was the eldest son of John and Annie Shield of Park Gates. When he was a young child the family had lived at the Riding, where his father was gardener and domestic coachman to the Walton family. 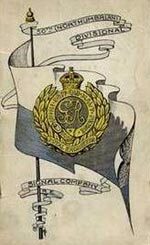 The 2nd Northumbrian was formed in January 1915 and formed part the coastal defence forces of the North-East of England. The division was broken up in July 1916 and Robert was among those who was attached to formations operating in Mesopotamia (present-day Iraq). Basra was captured by the British in 1914 and served as spearhead on the long campaign towards Baghdad. Baghdad itself was not captured until 1917. Sapper Robert Shield is commemorated at Basra War Cemetery, which made news again after the Iraq War of 2003. Unlike other cemeteries across the globe, Basra has not been maintained by the Commonwealth War Graves Commission. In 2003 British servicemen looked for graves of relatives and found the graveyard wrecked from years of neglect. The following is an extract from a report featured in the Independent newspaper (24 August 2003). The soldiers of Britain's forgotten armies of Iraq lie beneath the dirt and garbage of Basra's official war cemetery, almost 3,000 of them, their gravestones scattered and smashed, the memorial book long looted from the entrance , even the names of the dead stripped from the screen wall. The Commonwealth War Graves Commission is hoping to restore the cemetery at a cost of several million pounds. Archie was one of the sons of Peter Hetherington, a cabinet maker and painter, of Cross Keys House. He joined the 19th Northumberland Fusiliers which formed at Newcastle in November 1914. He also had a young wife, Emily. After training throughout 1915 the battalion moved to France in late January 1916, but Archie was not among them. He died in June 1915, perhaps in a training accident, and is buried at Masham in Yorkshire. Archie's brother Cecil did return to Allendale, after surviving the sinking of the SS Jacona a mere two months after the death of his brother. Cecil struggled to a drifting lifeboat and, after reaching it, managed to return to rescue the other nine survivors floundering in the water. Among other awards, he was presented with the Stanhope Medal for bravery; the Stanhope is all the more prestigious because only one medal is struck each year. Albert was another of the 420,000 British who fell at the Somme in 1916. He had grown up as the eldest of five children at Fell House where his father, William, was a limestone quarryman. He joined the 1/4th Northumberland Fusiliers and was attached to the 50th Division. The division was decimated at the Somme and Albert and many of his comrades were buried in the carnage of the battlefield. They are remembered on the Thiepval Memorial. The division was so hard hit that it was withdrawn and sent to IX Corps on the Aisne, which was believed to be a much quieter area. This was, unfortunately, not the case as the division was hit hard by a suprise enemy attack. Albert's widowed mother, Emma, received the news of his death at her home at Dryside House. As well as at Thiepval, Albert's name is commemorated on the lych gate at Allendale and the Cross at Keenley. Like Albert Henderson, James is also remembered on both the lych gate in Allendale and at the Cross at Keenley. He joined the Northumberland Fusiliers and died during the war, but research has yet been unable to confirm when. Of the J Hendersons from the Fusiliers who died, there are four possibilities; one died of his injuries at Berwick-upon-Tweed in 1917, another two in action on the Somme in 1916. The fourth died at Armnentieres in 1916, an area of trenches on the Belgian frontier, where the front line hardly shifted in four years of fighting. James may have been a younger brother of Albert but was almost certainly was some near relation because both of them lived towards Keenley. Thomas was a stoker in the Royal Navy and served on HMS Penarth, one of the Hunt (later, the Aberdare) class of minesweeper. The ship was one of many launched in 1917 which patrolled the North Sea seeking floating mines. 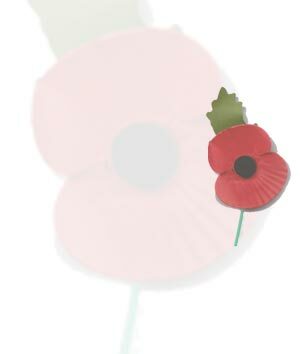 The armistice ending hostilities was signed on 11 November 1918 but for many the war was not over. The waters around Britain were still littered with lethal mines and the work of the minesweepers went on. On 4 February 1919 the Penarth was patrolling off the Yorkshire Coast when she struck a mine and sank. Thomas was among those who perished. He is also commemorated at Prudhoe New Cemetery. Richard Horncastle served in the Royal Field Artillery, manning the great howitzer guns which pounded the battlefield before a great attack and turned the landscape into a muddy, twisted wasteland. Set some way back from the front line trenches the casualty rate among gunner units was less than those of some infantry divisions. Like Robert Elliott, his battery landed at Gallipoli in April 1915 and was involved until the evacuation of Helles between 7 and 8 January 1916. By mid-1916 Richard's howitzer battery was fighting on the Western Front; firing shells at the Battle of Albert where Septimus Fairlamb was wounded, through the first Battle of the Scarpe where Frederick Glendinning fell, Poecappelle where Edward Forrest died, and the Battle of Cambrai in late November 1917. Cambrai is famous for being the first time that tanks were used in significant force. The attack began early on the morning of 20 November with an intensive fire barrage on the Hindenberg Line, followed by a curtain of a creeping barrage behind which the tanks and infantry followed. By 23 November an advance of five miles had been achieved, little short of miraculous, and victory bells pealed in Britain as a result. From 23 to 28 November the British were beaten back. A salient had emerged, German defences were strengthed, and entire Allied battalions were wiped out by shellfire at Bourlon Wood. Others were cut down by machinegun fire on the approach to the village of Bourlon. As snow began to fall on 28 November, life began to return to trench normality as troops settled into newly-won positions. Richard Horncastle did not live to see the snow and the end of the battlehe died on 25 November and was buried at Flesquieres Hill, south-west of Cambrai. Alfred Gillender was a lieutenant in a South Staffordshire battalion which was attached a Lincolnshire battalion of the 17th Division early in the war. The early days were somewhat chaotic, the new volunteers having very few trained officed and NCOs to command them, no organised billets or equipment. This may be a reason why Lieutenant Gillender was transferred to the Division. Henry Whitfield was a Private in the same division. The division landed in France in July 1915 and served on the Western Front throughout the war. It suffered heavy losses at the Battle of Albert in the opening stages of the Battle of the Somme (1916) and then fought in the First and Second Battles of the Scarpe in the Arras Offensive. Gillender is buried at the village of St Nicholas in the Pas-de-Calais. After March 1916 this area was located some way back from the frontline but within range of German artillery fire; the cemetery was used by all the divisions and field ambulances on that side of Arras. 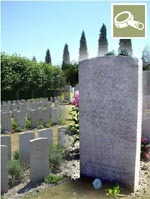 Alfred Gillender died while the Second Battle of the Scarpe raged in the area on 10 April 1917. Another widowed mother in Allendale heard of her son's death when George Johnson was killed on 30 December 1917. He was only 19 and his mother, Jane, lived at Glen View House. Some miles outside Alexandria in Egypt stands the Chatby Memorial. This structure commemorates almost 1,000 Commonwealth servicemen who died during the Great War and have no other grave but the sea. Many of them were lost when hospital ships or transports were sunk in the Mediterranean, sailing to or from Alexandria. Others died of wounds or sickness while aboard such vessels and were buried at sea. The 1/5th Argyll & Sutherland Highlanders had fought throughout the war in the defence of Egypt, the Gallipoli landings and Palestine. It is not certain if George had enlisted at the time of all of those campaigns. He was in the Eastern Mediterranean on the morning of 30 December 1917 when HY Aragon arrived at Alexandria. HY Aragon has begun life as a liner in 1905 (sailing between England and Brazil) and served as a troop ship from 1915. After arriving in Alexandria harbour with 2,700 onboard, the Aragon was ordered out of the harbour as no berth was available. Immediately having cleared the harbour she was torpedoed and sank with a loss of 610 lives. As the Aragon was listing from the torpedo attack, HMS Attack and HMS Points Castle came to her aid. The destroyer, Attack, was then torpeoed by the German submarine UC34 and also sank. It is very possible that George Johnson was on the troop ship Aragon, sailing to join his regiment in Alexandria. The Aragon and the Attack were the only two ships sunk that day. It may also be that he died aboard a hospital ship, only further research could confirm this. The accompanying photos of the attack were taken by surviving Deck Officer John FA Thompson. Rifeman Forrest belonged to the Prince of Wales's Own, a West Yorkshire Regiment. At the time of his death, his parent's lived at Monk (towards Whitfield) and his wife, Isabella, at nearby Carr's Mill. Unlike others from Allendale, Edward made it through the nightmare of the Somme only to die at Poecappelle on 9 October 1917. Also called the first battle of Passchendaele, the Battle of Poecappelle was launched on 9 October with the ridge upon which Passchendaele stood as its main objective. Heavy rain and an artillery bombardment turned an already poorly drained battlefield to mud and many big guns were unable to be brought within range. The advance of British and Australian infantry also wallowed in the mud and with little artillery support they were forced to withdraw. Like many who died at Poecappelle, Edward Forrest is commemorated on the Tyne Cot Memorial in Flanders. So called because North-East men compared the German pillbox around which the cemetery was sited to the cottages of their native county, it is the largest Commonwealth war cemetery in the world. George left his family home at Kiln Burn, Catton and joined one of the many units that had been raised by public subscription and private projects. The battalion was taken over by the War Office in August 1915 and moved to France between 7 and 15 January 1916. The unit saw service at the Somme in 1916 and during the Arras Offensive of April and May 1917. Losses were very heavy in the two battles of the Scarpe at Arras, a similar battalion lost six officers and 37 non-commissioned officers and men. Four hundred and seven were wounded and one hundred and ninety-nine reported missing. Private Maughan was one of the fallen, he died on 24 April. He is remembered at Aubigny Cemetery near the battlefield. Lempire is a small village, north west of St Quentin. It once contained a German prison camp, but was twice taken by British troops (April 1917 and September 1918). Thomas Maughan is one of over 10,000 men commemorated there. Thomas Maughan must have been a small-built man, desperate to serve his country. He belonged to one of the so-called 'Bantam Battalions' of the Durham Light Infantry. These had been sanctioned in late 1914, made up of undersized men who had previously been rejected as being under height. Many of the men were miners from the North-East of England. By the end of 1916 it was found that the general fitness of men volunteering as bantams was no longer to the required standard and undersized men were no longer accepted. Thomas Maughan died in France in July 1917. In a local newspaper published after the war, William is listed as Private Willie A Graham. Of six W Grahams of the Durham Light Infantry killed, four can be discounted as having different second initials or ranks. Of the remaining two, both were killed France in 1918 and belonged to the 15th Battalion. One is listed as WA Graham who died at the Somme in April 1918. He is buried at Esquelbecq (on the Belgian border) 25 km south of Dunkirk. The battalion was attached to the 21st Division and crossed to France in September 1915, its first experience in France being truly appalling. Sent into action at Loos on 26 September it lost 3,800 men for little gain. It went to fight at the major engagements on the Somme and Cambrai in 1918. Henry Jackson is another soldier who is hard to trace. He was a gunner in the Royal Garrison Artillery. Four gunners of that name died during the Great War. Harold joined the same regiment as Edward Forrest, although he was in the 10th Battalion. His battalion joined the 17th Division where Lieutenant AW Gillender also served. The early days were somewhat chaotic, the new volunteers having very few trained officers and NCOs to command them and no organised billets or equipment. The division landed in France in July 1915 and served throughout the war on the Western Front. It suffered heavy losses at the Battle of Albert in the opening stages of the Battle of the Somme (1916) and then fought in the First and Second Battles of the Scarpe in the Arras Offensive. Whitfield must have been severely wounded in the Second Battle of the Scarpe (where Gillender also died). He died, and is buried, at Duisans Cemetery, Etrun. This lay about 9 km west of Arras, back from the Front, with burials being made from three casualty clearing stations. Most of the graves relate to the Battles of Arras in 1917. The Pozieres Memorial relates to a period of crisis in March and April 1918 when the Allied Fifth Army was driven back by overwhelming numbers across the former Somme battlefields. The memorial commemorates over 14,000 casualties of the United Kingdom who have no known grave and who died on the Somme between March and August 1918. Sydney Robinson is one of them, as is William Glenwright. Sydney had joined the 2/5th Battalion of the Duke of Wellington's (West Riding) regiment, whose early clothing and equipment supplies were haphazard. The division was concentrated on the Western Front by January 1917 and served there until the Armistice. In January 1918 the Division took over the front line in the Arras area between Gavrelle and Oppy, facing a major offensive in late March 1918. After a magnificent stand against overwhelming force, the division was relieved on 1 April 1918. Sometime afterwards Sydney Robinson died, on 10 April 1918. The Thiepval Memorial at the Somme. 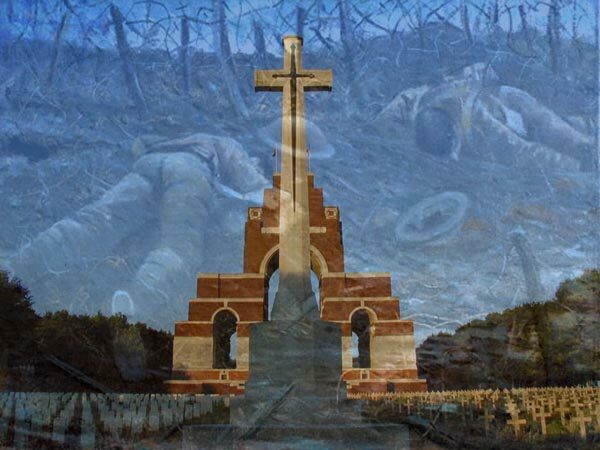 Dedicated to the missing 72,000 officers and men of the United Kingdom and South Africa who died in the Somme sector before 20 March 1918 and have no known grave. Research has not yet been carried out.